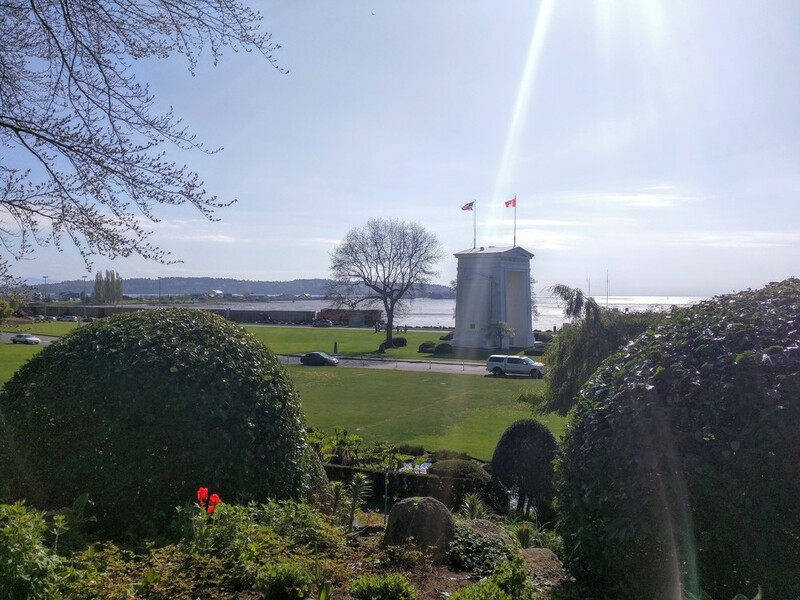 Dedicated in 1921 by Washington philanthropist Samuel Hill, Peace Arch is a one of a kind monument. In the interest of peace and nations, this is the only international gateway of its kind in the world. The arch straddles the 49th parallel, the international border line, and the surrounding park lies within both the U.S. and Canada. Visitors from either nation may walk through the arch and park without passing through customs, so long as they remain in the park boundaries and exit through the same side they entered. "The Arch commemorates the signing of the Treaty of Ghent in 1814 and the Rush-Bagot Agreement in 1817. Entered into by the king of England and President Monroe, these treaties provided for an unguarded United States and Canadian border from the Strait of Juan de Fuca to the Bay of Fundy in Nova Scotia. Both treaties resulted from the War of 1812 with Great Britain." Construction of the arch was completed on September 6, 1921. Samuel Hill, who is also famous for the Maryhill Stonehenge Monument, inspired the concrete structure. The following words are transcribed on the arch: "Children of a Common Mother", "Brethren Dwelling Together in Unity", "May These Gates Never Be Closed", and "1814 Open One Hundred Years." Also on the arch are two niches, with plaques placed over them, each containing remnants of famous ships from each country. On the American side is the Mayflower, while the Canadian side has the S.S. Beaver. The Washington Mayflower Society has a fascinating, in-depth article of this. To commemorate the seventy fifth Anniversary of Peace Arch the non-profit group International Peace Arch Association (formerly known as United States/Canada Peace Anniversary Association) was formed by founder and president Christina Alexander. Since the groups formation in 1995 it has put together a historical video, "Portal of Peace" curriculum packet, established the “Peace Arch Park International Sculpture Exhibition", and it holds many annual events to celebrate the arch and inform the public of its history. The park is actually a combination of two parks: Peace Arch State Park in Washington and Peace Arch Provincial Park in British Columbia. 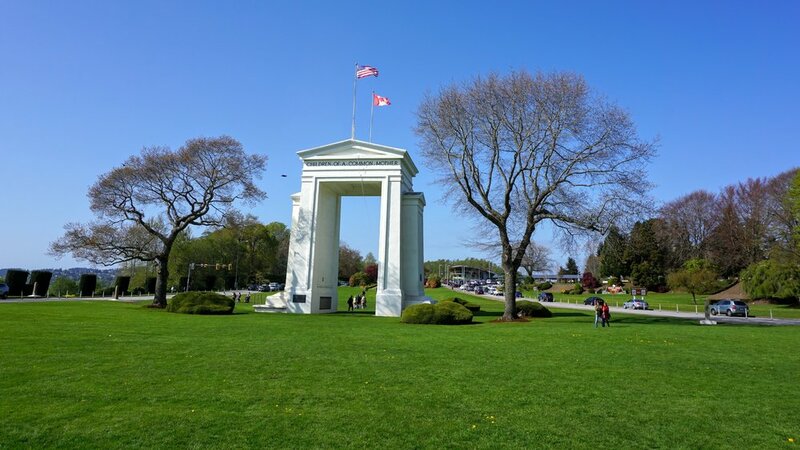 The two are joined together to form Peace Arch Park which lies on both sides of the border and spans across I-5 in the U.S. and Highway 99 in Canada. In the center median of the Interstate/Highway is where Peace Arch is located. We parked at Peace Arch State Park, placed our Discover Pass in the window, and started walking the grounds towards the Interstate. This is one of the most beautiful parks we've been to. It's filled with a variety of flowers, plants, trees, and gardens. Each flower and tree has a rock placed near its base with the name hand painted on it. The grass is green and well kept. Paved walkways, benches, picnic tables, a gazebo, a swing set, and many monuments and historical markers make up this area. There's also an American Kitchen in the park that's available to rent which can accommodate up to 100 guests and provides many amenities. As we walked toward the arch we had a clear view of Semiahmoo Bay and Point Roberts. Crossing into the median was simple as vehicles were either backed up and stopped, or moving slowly, all due to the upcoming border crossing. A crosswalk is present in two locations. As we moved into the center of the park we were greeted with the American Flag and Canadian Flag flying high and waving in the wind from atop the arch. Each in their own country as the border crosses directly through the center of the monument. During our visit we never noticed any rules about where we were allowed to travel. From what we gathered online we could walk within the entire park on each side of the border without any problems. There were a few signs, distantly spaced, stating, "Leaving United States Border" but there was no fence. It left us curious as to what would happen if someone playing ball accidentally kicked it across the border. Would they be able to walk over there, grab it, and return without any problems? This is certainly a possibility as the playing field on the U.S. side borders up against 0 Ave and homes along it on the Canadian side. We never noticed any cameras and only one Border Patrol agent who was parked on the far end of the state park. We wandered around and through the arch, taking plenty of photos. Then we crossed the highway again, but this time on the Canadian side. Here there was a sign stating that we were in Peace Arch Provincial Park with plenty of flowers, large trees, and gardens nearby. A portion of this park is elevated and we walked up some steps where there were benches to sit down on and take in the view. There's also a small pond with a bridge which is shaded by a large tree. Again, this was a beautiful park! We crossed back to the middle one more time and took photos of all the memorials, monuments, and inscriptions that we saw. On either side of the arch there are two markers which locate the border. We stopped to take more photos of us straddling these markers. We then headed back towards the parking lot. We noticed yet another marker indicating the border and took some more photos of us around it. It was now time to make the 2.5 hour drive home. We were very happy that we opted to make the extra drive up here from the tulip festival in Mt. Vernon, where we stayed the night prior. This area is not only beautiful but it's full of history and is a one of a kind, unique opportunity to cross the border freely. We certainly recommend visiting! This is a great park for the whole family. It's a bit of a drive but definitely worth it.